La Samplephonics ci stupisce con uno stupendo regalo Pasquale, un vst gratuito per Kontakt. Si tratta del Leeds Town Hall Organ, più di 3 Giga di Campioni. The picture speaks for itself. 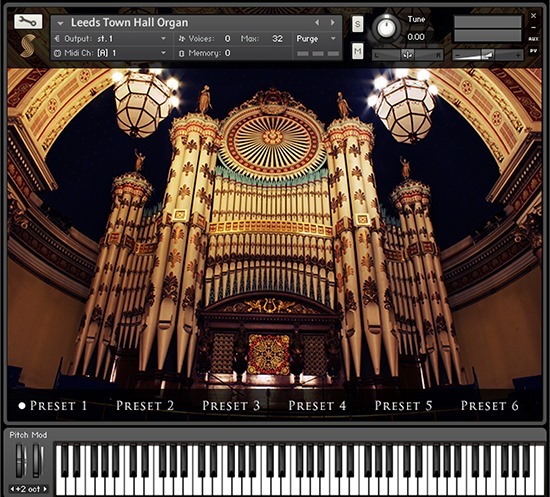 Within the beatifully decorated town hall of the city of Leeds in England lies this spectacular organ, towering high into the music hall and silencing the sounds of the city with its earth shuddering, rich, harmonic tones. This project was part of a new chapter for Samplephonics known as Sonas, who will be unveiling some spectacular virtual instruments over the coming year. More on that soon! We spent some time with organist Dr Simon Lindley who told us all about how the instrument works, it’s history and even a guided tour up in to the inside of the organ itself! Simon crafted 6 versatile presets for us and we began the painstaking process of sampling this incredible feat of engineering. Over the next few months we spent many evenings in the town hall recording every single note with multiple round robins and over 10 second note recordings to capture the true sonic character of the organ. The repetetive nature of the task actually became quite hypnotic and a strange bond began to form between us, the organ, the building and the very spirit of the city of Leeds. This entry was posted in cubase, Free, Plug In, Samples Libraries, sconti, Software, Vst and tagged church, classical, download, free, gratis, kontakt, organ, organo, samplephonics, torrent, virtual instruments, Vst. Bookmark the permalink.